The bill on the official use of Albanian language in Macedonia has received the green light from members of the ruling Democratic Union for Integration (DUI) headquarters, on Wednesday evening. The Social Democratic Union of Macedonia (SDSM) has provided a draft version of the bill, but DUI and Alliance for Albanians, in cooperation with legal experts, drafted a new version of the bill which enables the advancement of legal status of using the Albanian language in more dimensions. DUI spokesman Bujar Osmani at the end of the meeting said that DUI's central leadership after elaborating all the arguments related to the bill, unanimously agreed on this bill. Osmani said that in this meeting where the elected MPs of the Macedonian Parliament from this party participated, more than 20 articles of the bill have been examined in detail. He said that from today, SDSM talks will begin about the harmonization of the governance platform. "We closed this part of the debate and from Friday we expect to start discussions on eventual harmonization of the platform for co-governance. 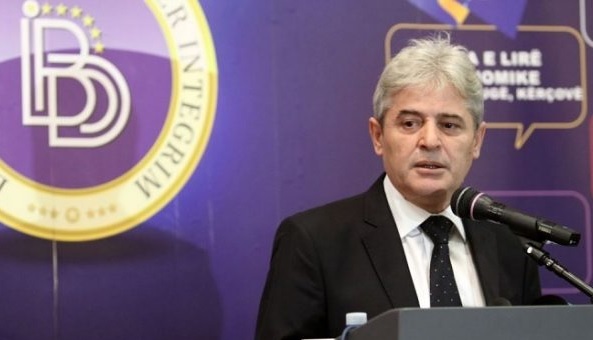 DUI has today given its consent to the draft law on the officialisation of the Albanian language, from which we can begin discussing other issues as well," said Osmani.